The MaxProLogic is designed to make digital design easy and cost-effective. 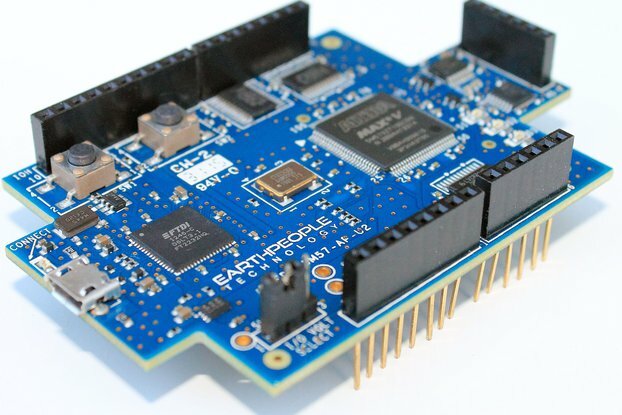 At Earth People Technology we have years of experience helping students and hobbyists get started with FPGA design. We know that the learning curve in getting started can be a time consuming and frustrating event. So, we created a User Manual that walks the user from unpacking to creating the first project to creating an epic project that will get attention. 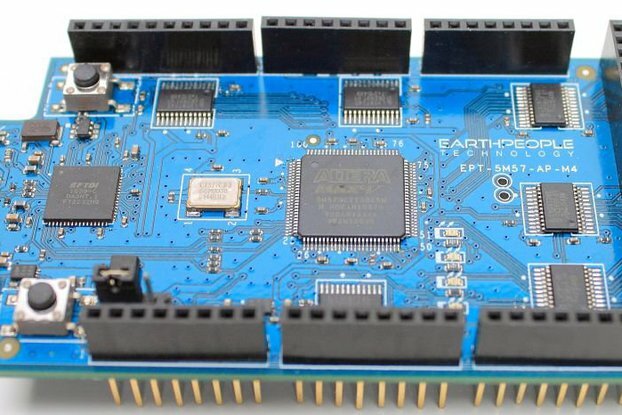 The core of the MaxProLogic is the Altera MAX10 FPGA. 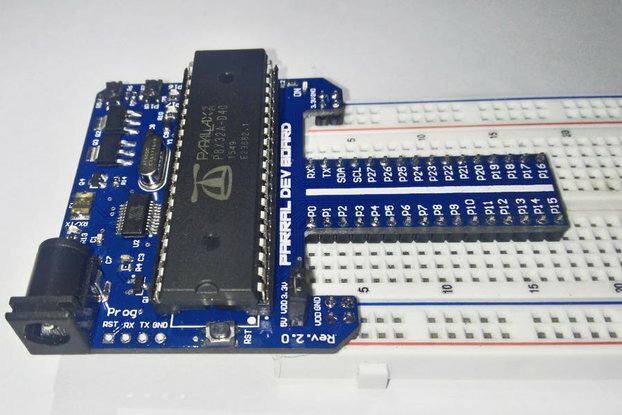 This powerful chip has 4,000 Logic Elements and 200Kbits of Memory. The MAX10 is easily scalable from the entry level college student to the most advanced projects like an audio sound meter with FFT. Upon the many great features of the MaxProLogic is the MAX10 chip has a built in Flash for configuration and incorporates 8 channels of Analog to Digital Conversion. 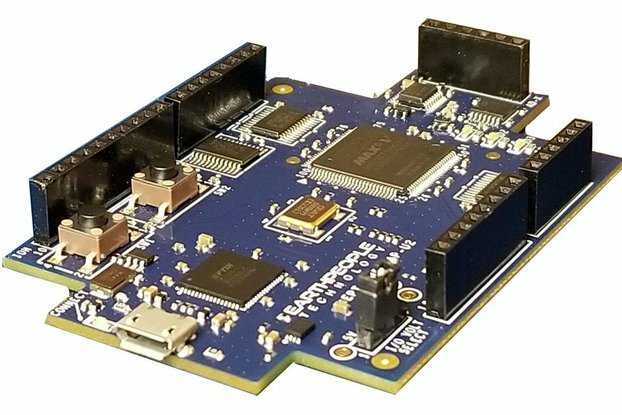 These two features alone create a far superior FPGA chip than any competitor on the market. It allows the user to create more diverse projects. The MaxProLogic is designed to make digital design easy and cost effective. 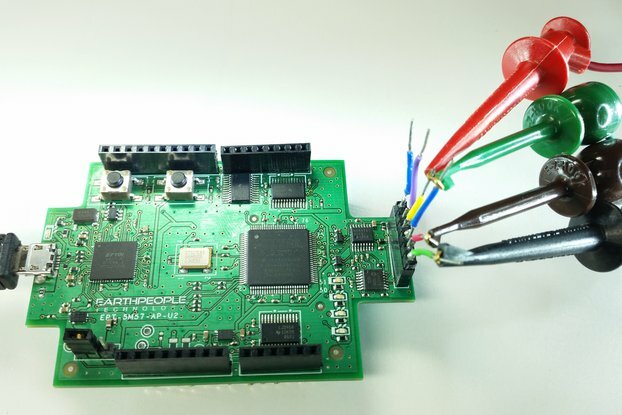 At Earth People Technology we have years of experience helping students and hobbyists get started with FPGA design. We know that the learning curve in getting started can be a time consuming and frustrating event. So, we created a User Manual that walks the user from unpacking to creating the first project to creating an epic project that will get attention. In short, the MaxProLogic will cut the time to get the time to get up and running significantly. We also include several pre-made, fully compiled, fully synthesized projects for the user. You can start your project by copying one of these premade projects and adding user code. Simulation has always been a weak point for students and hobbyists. 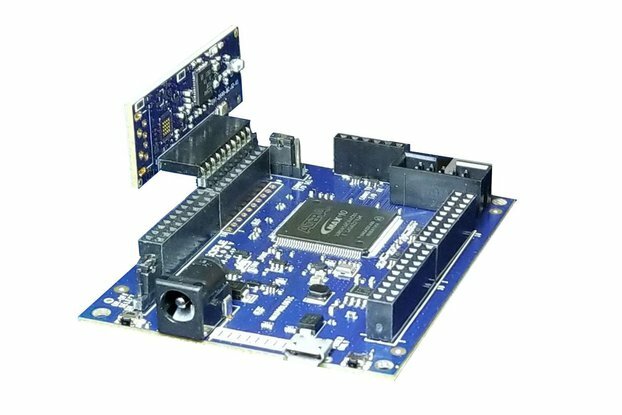 Most FPGA beginners write the user code, compile it, synthesize it, program the chip then test out the results. While this approach may work for small, simple designs, it quickly becomes a problem with larger projects. As the user code increases in complexity, better development tools are required to quickly isolate problems. The premier method for this is functional testing. ModelSim is included Free with the Quartus Prime Package. ModelSim is a powerful tool for finding errors in the user code before you go to synthesis. The MaxProLogic leverages the Quartus Prime Lite Software for compilation and synthesis. This software tool is completely free and provides very powerful tools for the user. Also included free in the software tools is the simulation tool, ModelSim. 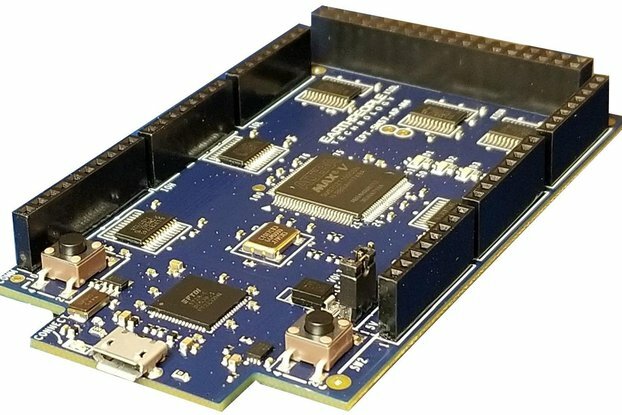 A lot of beginners to the FPGA world are hesitant about using simulation tools. They feel these tools are too difficult to learn and use. This is where the MaxProLogic breaks that fear. The MaxProLogic comes with a user guide that walks the user from startup to full simulation. Each step is well documented and explained. 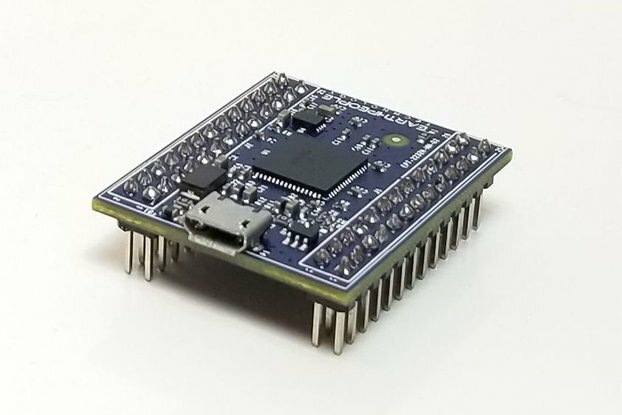 The MaxProLogic is Open Source Hardware based on the MAX10 FPGA. 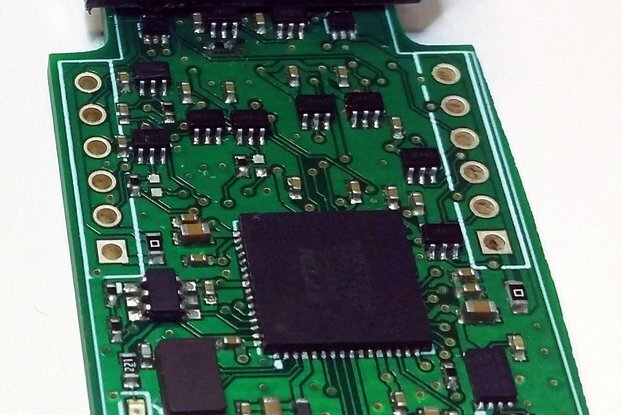 In addition to the on chip 8 Channel ADC and on chip Flash, the board is loaded with great tools. The board has two power options, standard USB Micro B connector and 5.5mm Barrel connector. You can run the MaxProLogic from a laptop with 2.5W of power. Or you can run it from the +5V @ 2A wall USB chargers for 10W of power. The barrel connector can handle up to +9V @ 3 A for 27W of power. 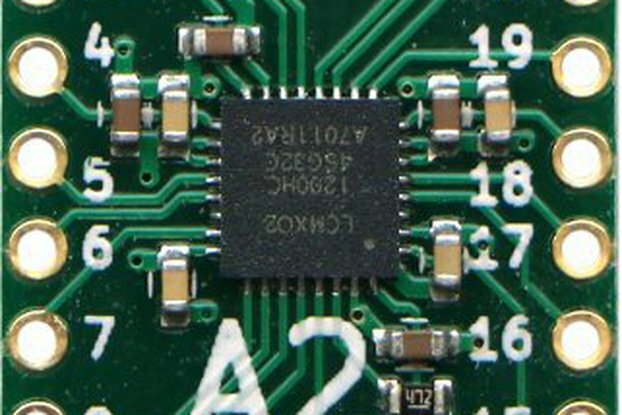 The MaxProLogic has a MicroSD connector on the bottom of the board. This allows the user to create a powerful long term Data Acquisition System. The board has an optional On/Off pushbutton switch that allows the user to turn the system on and off. There are two clocking options, 50MHz oscillator and 32.768KHz oscillator. The block diagram shows all of the parts of the MaxProLogic. 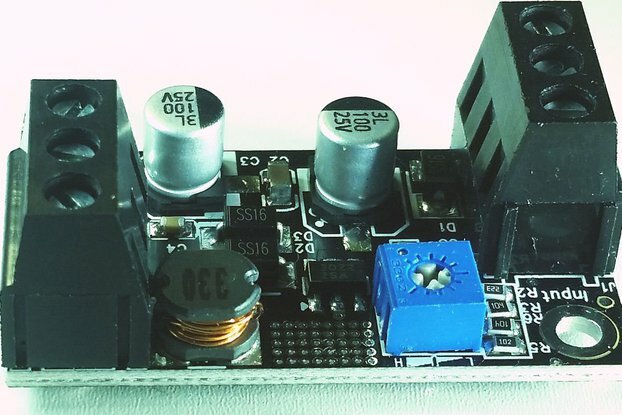 There is a main switching power supply for +3.3V. 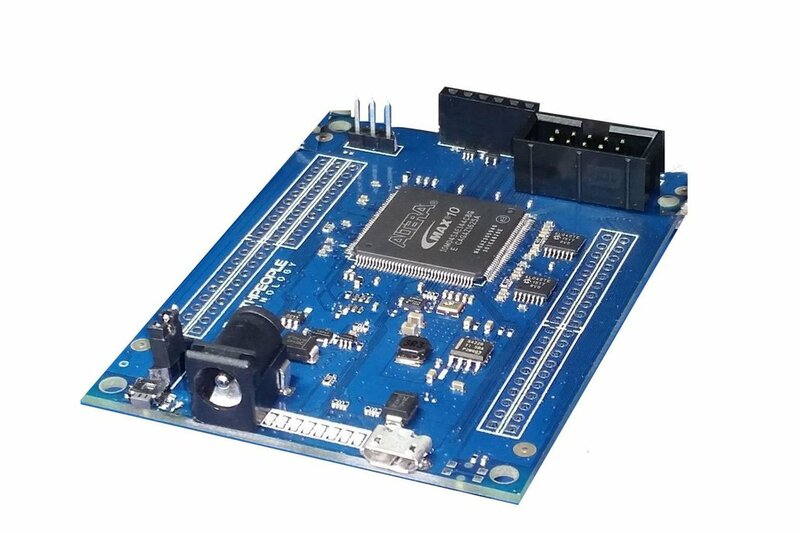 The +3.3V powers the core of the FPGA along with the Input/Outputs of the FPGA as well as provides power for user circuits.